You are sipping smoky Russian Caravan tea on the patio of an elaborate teahouse, talking and laughing with your friends. The rich pinks, bright reds, fresh whites and warm yellows of hundreds of roses fill your view and the heady redolence of their perfumes fills the air. A brisk stream is flowing nearby. Are you in Samarkand? Tashkent? No, this scene is in Boulder, Colorado at the Boulder-Dushanbe Teahouse. Now, at the fourth anniversary of the completion of the teahouse and the planting of the rose garden, an exuberance of roses is anticipated for May and June and plenty of flowers until frost. These roses are not the hybrid teas and floribundas that have been popular in the 80-100 years of recent history; these are wild species roses, heirloom roses from the 13th through the 19th centuries, plus modern shrub roses from the Canadian breeding program, David Austin roses and others. These varieties were chosen for their cold-hardiness, disease-resistance, fragrance and general ability to thrive in Colorado. 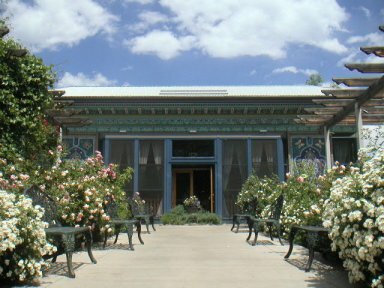 How did a teahouse from Tajikistan and a rose garden from Boulder come together? It started in 1987 when two Boulder women, Mary Hey and Sophia Stoller initiated a “Sister Cities” program. The idea was that even though the US and the Soviet Union were having a cold war, ordinary citizens and cities could have warm, friendly relations. So Dushanbe, a city in Tajikistan, and Boulder became Sister Cities. In honor of this opportunity, the mayor of Dushanbe gave Boulder an extravagant gift: a beautifully crafted and elaborate Tajik style teahouse. The intricately carved, painted and tiled structure shows off the skill and tradition of over 40 Tajik artists. The entire 2,343 square foot masterpiece was built, disassembled and shipped to Boulder in 1990. Problems with finding a site and funding the project delayed erecting the teahouse for ten years. Construction finally began in 1997 and was completed in May 1998. Many people worked to accomplish this, but especially instrumental were 1998 Mayor Linda Jourgensen, then president of the Sister City project, Mary Axe and architect Vern Seiroe. The teahouse is now standing proudly at 1777 13th street in Boulder, across from the downtown park. The theme of the interior is a rose garden, with stylized leaves and flowers in paint, wood, plaster and ceramic, all in greens, blues, and rose–pinks. 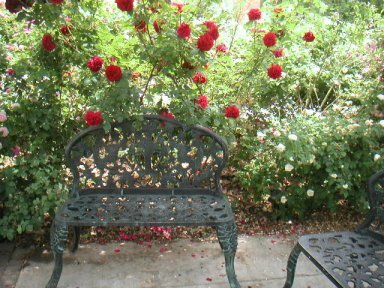 Rose imagery has long held prominence in Tajik and nearby Persian cultures; and according to Tajik tradition, the garden surrounding a teahouse is a rose garden. 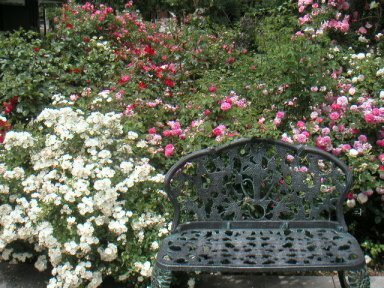 Early in the spring of 1998, Dawn Penland, then president of the Boulder Valley Rose Society was contacted about helping to design the rose garden. Because the idea was to use fragrant, old-fashioned and shrub roses such as one might find at a traditional teahouse in Tajikistan, Dawn called Eve Reshetnik who is a landscape architect and very knowledgeable about those roses. She in turn called Mikl Brawner of Harlequin’s Gardens who specializes in hardy roses. Vern Seiroe explained to them the design criteria a follows: the rose garden is to appear unplanned and is to create a celebration of color and fragrance. Eve and Mikl then went to work to select the varieties which would be the most successful for the Boulder area, with special consideration given to fragrance, disease-resistance and cold- hardiness. Eve designed the placements of the sixty roses, considering the symmetry of the building, its monumental character and the ascending entryway. She chose to give the garden a graduated height along the ramp, starting low and coming to a crescendo nearest the building with some very large roses which get 8—10′ tall at maturity. The once-blooming roses that give the greatest splendor in bloom were mixed with the repeat-blooming roses so no area would be “barren” during the summer and fall. The colors were combined in a sympathetic but informal arrangement. Whereas some roses were used more than once, over 50 different roses were chosen. This variety helped create the sought-after “unplanned” look, as well as providing delightful surprises. It also allowed the garden to function as the hardy rose demonstration garden of the Boulder Valley Rose Society. Mikl and Eve agreed that it was important that all the roses be on their own roots. In general, most roses are grafted onto a vigorous rootstock because this method produces greater numbers of roses, faster. However there are serious disadvantages. The graft is more cold-sensitive than any other part and if the graft and top dies, the rootstock rose will come up instead. Another method of propagating roses is by cuttings. In this approach, pieces of the stem are kept misted until roots form. These roses are known as “own-root”. They take longer to become ready for sale, but are generally more cold-tolerant, longer-lived, more floriferous; and if the plant dies to the ground in a harsh winter, the original plant will come up from the roots. 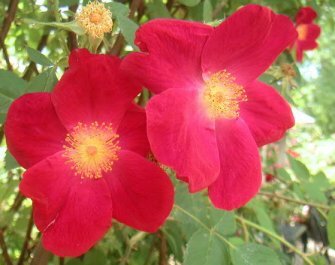 Therefore, by using own-root roses, the plants would be stronger, healthier and longer-lived. This was important since the main aim of the rose garden was to be more than a visual experience; it needed to be an enduring environment that delights the senses and calms the spirit, and is both inviting and intimate for the teahouse patrons sitting on the patios. The soil that was brought in was the usual clayey topsoil which holds water well and is rich in minerals. However it is very heavy and does not allow enough oxygen to the roots, so several yards of compost were tilled in. 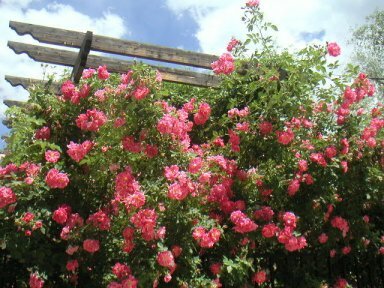 Then in May of 1998, members of the Boulder Valley Rose Society donated and planted the roses using Mile-Hi Rose Feed and alfalfa meal. And the city of Boulder installed a microsprayer irrigation system, to keep water from being sprayed on the leaves, which can cause fungus problems. Since then the Rose Society has maintained the garden using organic methods. The results have been beyond everyone’s expectations. Not only have the plants grown rapidly, but they have been thankfully very healthy, and the colors and fragrances are deeply satisfying. Do come for a visit.